Can I Haz Moar Peoples!!! That’s not new — the quest for eyeballs is as old as online business. And it does matter. It’s important to have a critical mass of folks who know you exist. Ask anyone trying to get a business off the ground with an email list of 34 people, 8 of whom they’re related to. You need a big enough audience to allow for a meaningful response when you try out a new content idea, or craft an offer for your product or service. But there’s no shortage of online publishers with big audiences and tiny businesses. If all you do is stand on the Information Superhighway trying to flag people down, you’re going to get flattened. Instead, craft a thoughtful, well-designed path. Lead prospects from the noise and clutter of the larger web to a sustained and valuable connection that solves the problems they care about. Smart business isn’t about gaining a massive amount of attention. It’s about gaining the right kind of attention from the right people … and continuing the journey from there. When you want to persuade, it’s useful to take a look at the classic “formulas” of copywriting — because copywriting is simply persuasion that takes place (partly or completely) without the help of an individual human salesperson. Most of these formulas begin with the letter A — which stands for attention. And that’s what most marketing strategy tends to focus on: how to get the attention of all those distracted folks zooming around the web. Back when copywriting was very, very hard, you had to do all of those steps with one piece of content, often something printed on paper and delivered by post. Today, we get a lot more shots. We can handle each of those elements with individual content. Even better, we can craft multiple pieces of content to serve different functions. So if you need to spend more time addressing a topic that interests your audience, you can craft a content series, or even an entire content library. Another time-tested formula is P-A-S. This one doesn’t start with A, but it does kick off with a compelling audience problem, which inherently tends to grab attention. Agitation means getting into the problem in a deeper, more emotionally resonant way … and then the business can step in to solve the problem. These are good formulas, and they still have their place. But in a content marketing environment, they tend to dramatically underestimate the complex role of those middle letters. Attention strategies are fun to learn about. Potent headlines, exciting images, killer hooks. But when you’re working on a landing page, a video sales letter, an infomercial, or a 15-second radio ad, the middle can be the toughest part. The middle starts to look like actual work. You’re cultivating the relationship. That means a significant part of the “middle” of your content marketing is about offering value generously and being a decent human. Where are the rough patches? Most paths have some rough spots — places that aren’t as easy to navigate. It seems like it only works for other people. It seems hard to get started. It seems like a long time before I’ll see results. A smart, well-structured content path will include work that speaks directly to these objections. You might tell stories that show the audience how someone else wrestled with the issue. Or offer clear, simple explanations of product features — perhaps an infographic or explainer video — to show how your solution overcomes the problem. If I wanted to craft a persuasion formula for the 21st century, what would it look like? I’d need to start by knowing who I wanted to speak with. What do they care about? What kinds of problems could I help them with? So the first letter might be K for Knowledge or E for Empathy. From there, I think I’d go to Connection rather than Attention — simply because attention today is so fleeting. I’d try to spark a moment of connection instead, to have some chance of a more enduring relationship. In my experience, building connection usually combines speaking to a problem the audience cares about and speaking from a position of shared values. That kind of principled problem-solving constructs a content path that is marked by Usefulness. What kinds of content could I create that my audience would find valuable? What problems could I solve? Is there some “low hanging fruit” I could help my audience pick? What Objections could I address? What risks could I manage for my audience? Along the path, I’d try to craft some introductory Offers that helped people try my ideas out for themselves. In other words, some inexpensive ways they could pick up products or services — maybe even free products or services — that would help them get something they want. If there were key Beliefs, assumptions, or convictions that the audience needed to adopt to go further, I’d also talk about those. For example, at Copyblogger, we believe it’s unacceptably risky to put your entire business on a platform someone else controls, like Facebook or Tumblr. I’d use my useful content path to make the Case for my solution to my audience’s problems — keeping an eye open for the audience’s responses and desires, not just my own assumptions about what they need or want. Along the path, I’d remember to Ask for the audience’s action on a more significant offer and Measure how they respond. Put another way, I’d measure their Engagement by seeing if there’s a product or service they feel ready to buy. Did they like the offer a lot? Did lots of folks complete the transaction? I’d Iterate and craft more offers like that one. Did they hate it? Did just a few or no people take me up on the offer? Again, iteration would lead me to put something together that was better aligned with the audience’s desires. Finally, I’d work on Sustaining the relationship. It’s great to do business once — but it’s more satisfying (and makes better business sense) to create long-term relationships in which the audience and the business grow together. To that end, I’d make a commitment to Delivering value over time and keep looking for new ways to serve that audience. That leaves me with something like ECUOOBCAMEISD. Hm. I definitely had to massage a few things to come up with a decent acronym. So, how would you tweak it? What you are describing is pretty much the same experience I have made. Hard trurth: Doing it wrong and hit myself into the face, over and over again. As you said, customers are looking for a connection. I found out over the last month, that this connection can be made through a clear vision by myself. I encourage everyone I meet to have a crystal clear vision about what they want to change in the world. This type of thinking includes problem-solving thinking, but it goes one step further: It paints a nice and beautiful future if your customers are following you. Marriage formula! It’s a perfect metaphor! Now I’m going to be thinking about my boyfriend like a prospect. LOL! Driving the traffic is the biggest problem for many bloggers. I like the persuasion formula. AIDA can help to craft a content which can allure more people. Embedding the catchy headlines in between is a plus point. Human eye is more reflective to the visual content. Images would be do the best. As I am new in copy writing I found this really helpful as it lets me know that the to have a traffic in my site is not my main goal but on how to attract, create a relationship and how to sustain it. It is a pretty challenging as the taste of people is constantly changing, but with the following guides I am be able to know on where should I start. 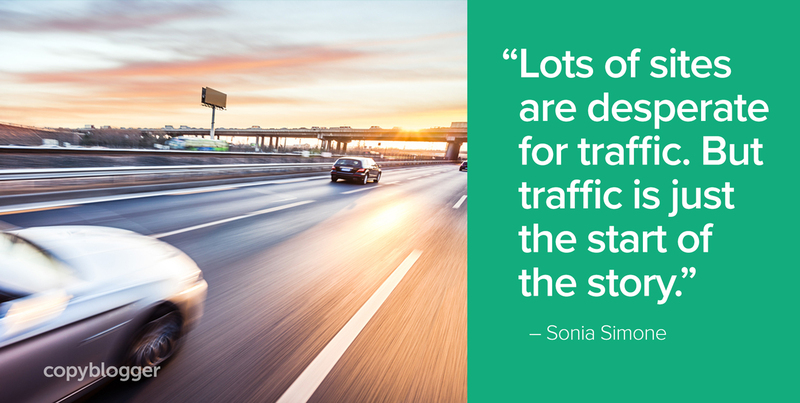 Anyone can get as much traffic as they can pay for. But if you don’t have a well-structured path to purchase, and excellent mechanisms for capturing attention as it flies past, traffic on its own doesn’t mean much. I loved your article, it describes exactly what strangles me, which I try to learn, but the path is slow. But it’s been worse. If I take every point you make (BTW – each one is excellent) and put them in the Know – Like – Trust model I can use them to build a long-term relationship with my customer. Know – Measure me up to see if I am a Useful Connection. Like – I like your Case and share your Beliefs, especially your Empathy. Your Offer overcomes my Objections. Let’s Engage. Trust – Ask and I will Deliver on each of your Iterations to Sustain this relationship. In short . . . Your MUCK shows me you’re a COOL BEE. DAT IS it. I added the K-L-T letters to the “In short…” phrase. Have you thought of using this to create a new paradigm to replace crosswords? This was fun. Perhaps a quiz? Great points! I love that you’ve highlighted being useful. That’s such a great way to measure the difference between noise and valuable content. Recently my challenges have been around addressing pain points in my copy and the way you’ve put it, Empathy, has given me a new perspective on it. It’s more about understanding than classic fear tactics. Sonia – Thanks for this. It’s so easy for folks to be obsessed with traffic that they forget about forging the human connection with their audience. Empathy indeed. Also, I love that you started with the traditional sales mantra of AIDA — which I first learned from Alec Baldwin’s iconic monologue in Glengarry Glenn Ross. Sounds perfectly genius to me, Sonia. Instead of MC-squared, you’ve got E-cubed. A big E with a superscripted 3. And shouldn’t E be the focus point, in any case? Empathy to the third power. They have forgotten value delivery and solution provision. To me, I believe it is only someone who does not know what he or she wants that will fall for that kind of marketing. I may be wrong, but my belief is that value delivery is what metamorphosizes into interest, which in turn creates trust and love. Without this steps, it will be hard for any transaction to take place. This is an eye opener for all marketers. Thank you for this great content.